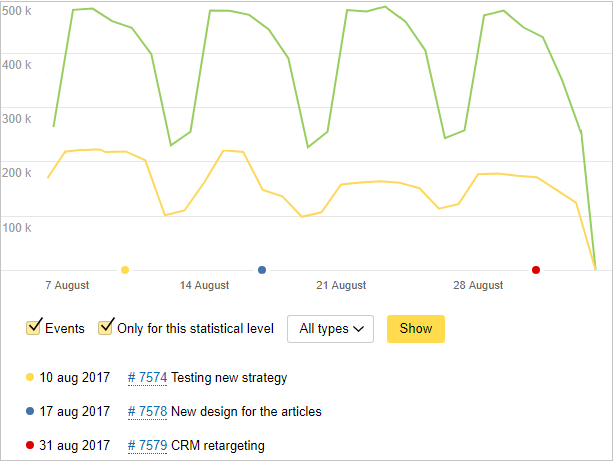 The event log helps Advertising Network partners conduct experiments and analyze statistics more conveniently. We recommend that you make a note of all important events on your site or app, such as the date of ad block position change or the date of site functionality errors. The selected events will be displayed in the statistics and will enable you to easily track changes associated with those statistics. Go to the on the Statistics page. To create a new event, click Add a new event, specify the date and type, and fill in the Description field. Select Statistics level and Product ID (for example, a platform or a block) that relates to the created event. You can also use the Event log tab to edit or delete existing events. Under event display settings — in a list with a detailed description (click the event number to edit it directly on the page). On a chart — with color dots on the X axis (dates).